Why is there a tree on the exposed beams of the under-construction Education Center at the Chicago Botanic Garden’s Regenstein Foundation Learning Campus? 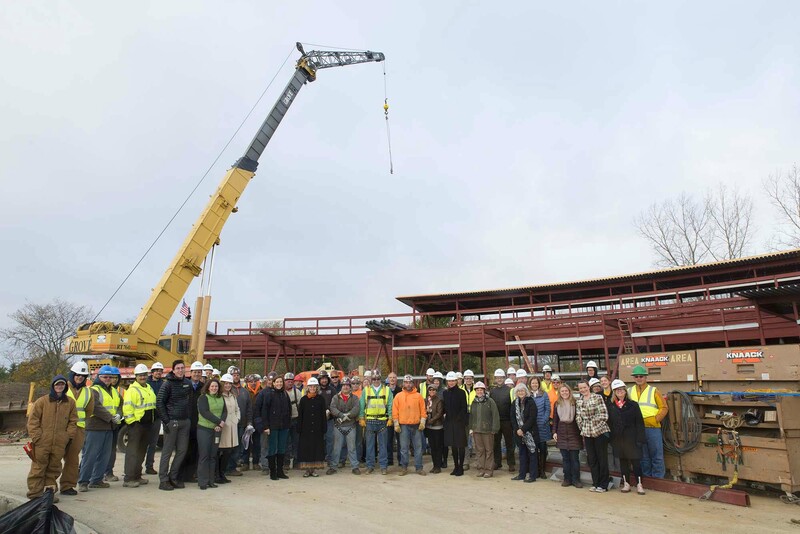 A construction worker “tops off” the site, as the team reaches the halfway point in the construction of the new campus. That tree is part of a more than 1,000-year-old tradition to recognize a very special moment in the construction of a building. 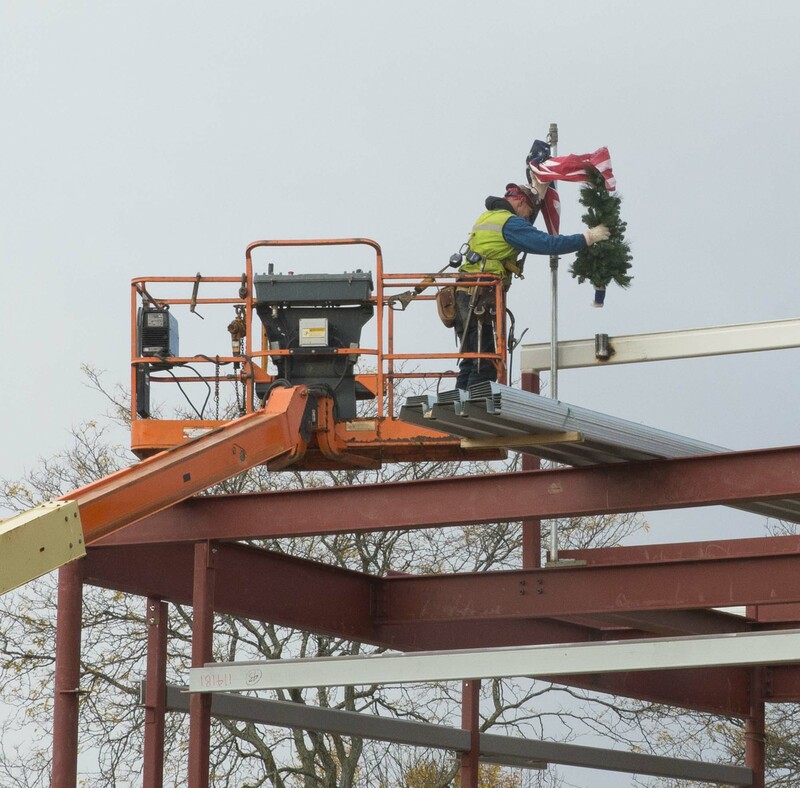 The tree is hoisted up and placed on the beams by the project’s construction workers, in our case by those from Waukegan Steel, LLC, during a “topping out” or “topping off” ceremony. The practice of placing a tree atop a building signals the end of the framing phase of construction, and it is a tradition that originated in eighth century Scandinavia. The tree used is often a pine, but it can be of any type; originally, sheathes of wheat were used. As the tree is raised, usually adorned by a flag, to the building’s final beam, the team celebrates with a toast or a meal. It’s a moment to acknowledge the workers’ skill and successful accomplishment, the safety of the worksite, and the transition to the next phase of the project. The tree also provides a blessing of sorts to those who will dwell, work, and play in the building in the future, and pays homage to the materials (originally wood) that make shelter possible. Despite the blustery day, the construction team was excited to celebrate the success of the project so far. We know that plants are critical to sustain life on Earth. Much of our food, clean air and water, clothing, medicine, and shelter derive from plants. And, in addition to needing plants to sustain life, we rely on plants to help us enrich our life and to celebrate its important milestones. We give plants and flowers as gifts—to court those we desire, to lift the spirits of friends or acquaintances who are sick—or to memorialize and honor those who have passed away. Guests coming to a friend’s house for dinner bring a fragrant hostess gift. In some places, a homecoming corsage is still part of coming of age. Our Science and Education curriculum is made possible by you, our generous donors and sponsors. So when I look up at the tree atop the beams of the Education Center on our soon-to-be Regenstein Foundation Learning Campus, not only do I celebrate this milestone of construction and the accomplishments of the steelworkers who are making this important project possible, I also think about how many wonderful ways plants enrich our lives.